Michigan leaders say they’re ready to put aside their differences to improve Michigan schools. LANSING – They stood in a row for a photo, but quickly realized the line was too long. They made two lines, they scrunched together, they smiled, and the cameras clicked. A small collaboration, but possibly symbolic. Thirty-four groups, ranging from business associations to teacher unions to charter school advocates, met for the first time Wednesday in Lansing with a common goal: improving Michigan’s struggling public schools. The diverse organizations, some typically on opposing sides of issues, promised to work together to improve education in the state. 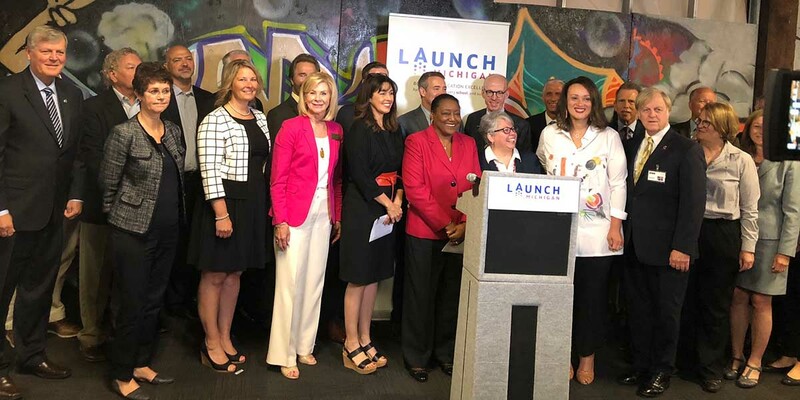 The joint effort, called Launch Michigan, is lauded as the most ambitious collaboration of philanthropy, education, labor, business and community leaders in the long, stumbling history of education reform in the state. By most measures, Michigan is in the bottom third of states in academic achievement. Michigan fourth-graders rank 35th in reading in the latest National Assessment of Academic Progress, often called “the nation’s report card.” Low-income fourth-graders ranked 49th in math on the NAEP. Michigan ranked last in the Midwest in every category measured by NAEP. The group’s launch marks the latest in a long list of efforts to address the shortcomings of state public K-12 schools. What makes this different is “the breadth and magnitude” of the groups involved and their level of commitment, said Tonya Allen, president of the Detroit-based Skillman Foundation. The fact that groups as diverse as the Grand Rapids Area Chamber of Commerce and the teacher union Michigan Education Association are sitting down together shows the coalition’s commitment to turn things around, several members said. Launch Michigan won’t be an independent organization. There won’t be a staff or a budget. Instead, the effort will consist of a collaboration among the groups to find common ground on education reforms, and a coordinated push to implement those reforms, Rothwell said. Don’t look for a comprehensive education reform plan from the group, Rothwell said. Instead, the group will pick a handful of issues that research shows impact learning. Those efforts are likely to include a push for more and better support for teachers and principals; accountability measurements for the entire K-12 system rather than just teachers; and elevating public awareness of the disappointing state of Michigan education. The hope, said Amber Arellano, president of Education Trust-Midwest, is to wall off education from partisan politics, where reforms tend to change every time a new governor is elected. States that have successfully reformed their schools, such as Massachusetts, Florida and Tennessee, have maintained education reform policies over a long period of time. To answer the question in the headline: Nope. It makes an impressive looking group picture but the divisions are so long and deep I don't see anything significant coming out of this effort. I’m looking for the links to the articles that Bridge posted on the effects of charter schools on our state education system. I’m wondering how the data of Michigan’s charter school effects compares to the effects of charter schools in other states. I’ve heard recently that charter schools are considered a major reason for a decline in the Arizona education system. We are so thankful for your excellent research into many topics that concern us in Michigan and the USA. Marie, Would you concede that most parents who yank their kids out of their assigned schools and send them to a charter school, aren't doing this because their kid's bored of being recognized for their stellar performance? So if this is the case and in many it absolutely is, the charters would be actually helping the traditional public schools by taking problem/malcontents off their hands? In my community, the schools who have the biggest complaint are the private and parochial schools who have seen charters eat their lunch. The hostility of the MEA crowd for entirely self-interested financial reasons, towards people choosing what ever Ed opportunity they feel suits their kid best is mind blowing. I'm agnostic but it's none of my business... or your's. The most useful thing a group like this could do is to agree on a set of demonstrable skills at minimum to be achieved in order to have a given graduate designation conferred upon a student. And get away from the 13 years , 180 days ,with x hours of seat time model. Given the participants probably not going to happen. Claiming how momentous this group is by simply sitting down together shows how all involve show what is importance, adults talking to adults. There is nothing in the article about student, it is about ratings, about teachers and administrators, and about all these organizations, and the system. Nothing is about the students, the student's role and responsibilities in their learning. Until it is about the students, about how students learn, about what they have to do to learn, about how they develop a desire to learn, about those that are succeeding at learning and what we can learn from them, nothing will change. The system can be degraded by all these groups and yet there are thousands each year that succeed in this system and only ones that seem to know this are the colleges and employers where these students go. This group is self-serving, this article is self-serving because it promotes the idea that adults decide whether students learn. Time and again we can look in any classroom [where everything is the same] and we see a distribution of academic success. If we talk to students in any classroom they will tell you who will succeed and who will disappoint. The students know that it is the individual students that determine their success because of their desire, there working at learning and their sacrifices for learning. If the people in these organizations and Bridge were to talk to the students, those who succeed, those who disappoint, those in between, they would what it takes to learn and why all the students aren’t learning. Learning is a bottom [students] up process to success, not a top [these organization, Bridge, and adults] down process. Until a student's desire to learn is raise to the point where they are willing to do the learning, nothing will change. No matter how many millions and billions are spent by and on the adults, it is the students. I see little coming from this group. In any group it only takes one member with a practice of guarded ignorance to uphold their beliefs, and that is well covered. What I have seen is something not discussed. With school of choice you get educators as more of the front line for the retention of student way more than the function of education advancement. This, I believe, is the very core of the problem with public education vs non-public. The non-public schools have been chosen for an expected quality and what must accompany a quality education rigorous requirements that truly challenge the student. Public schools have for decades taken the path of least restriction. They give out pre-test preparation that is the same as handing the student the test for them to memorize. Being able to memorize something will not get a student through a comprehensive exam. The decades long poor student data consistently shows this. It is my observation that public schools are frozen in fear of losing the seven plus thousand dollars per pupil they will do all they can to make it easy for the student, the high and easy grades even make parents proud that their child got over 100% on a test. I have seen the pre-test "this will be on the test" way too often in all of my education, including college. Now, do not go all in on an attract that it is the educators job to prepare the student. There is a very distinct line between saying something like this question will be on the test and saying you will need to demonstrate your understanding of "blank". Those two statements are miles apart. One demonstrates the ability to memorize something long enough for the test on the next day or obtaining a broad understanding of a subject that will allow the student to demonstrate that skill in a comprehensive test. I am always surprised at the hostility contained in the comments to articles. Isn't it better that different sides of really difficult issues are talking to one another? Doesn't this make at least incremental policy changes more likely to happen? Our State has been so divided in the approach to education, and I believe mostly by people of good faith but different philosophies. Let's applause and support a willingness of these diverse groups to at least sit down together. I agree that diversity of perspective is important when trying to develop innovative approaches to a problem. The political positioning of the organizations included in the group raises doubts about any possibility of change in the educational system that will facilitate improved student learning. Another concern is with who is present in the photo op, it isn’t people that deal with the students daily while they are learning, it is people that are at the highest level and deal with political negotiation everyday with organizations such as those represented in the group. This article is a good photo opportunity for all pictured, can be framed as a political opportunity, but history offers little hope for change in student learning improvement. If you want a change in the divide,' we need a specific description of what is to be achieved. Is it education system or is it student learning? This is hardly the first time a diverse mix of education groups has formed an umbrella organization to improve K-12 schooling in Michigan. In fact, there have been multiple groups, over several decades, brought together to do precisely that. Possibly that's where some of the cynicism around this venture is bubbling up: if collective efforts at reform have left us 'in the bottom third,' maybe getting folks together--with no budget or timetable--is not going to have much of an impact. It might even make things worse. The real meat of this piece: 'Those efforts are likely to include a push for more and better support for teachers and principals; accountability measurements for the entire K-12 system rather than just teachers; and elevating public awareness of the disappointing state of Michigan education.' That's what some of these groups (notably, Education Trust Midwest) were formed to do--get a quote in every major media outlet proclaiming public education in Michigan an abject failure (measured by a confusing merry-go-round of statewide assessment tests). Please remember that MI is ground zero for charter mismanagement and fraud--and that our sinking test scores reflect that, as well as continued incremental reductions in funding for public schools. The solutions proposed by many groups--the open education marketplace, and increased 'accountability'--have not resulted in improved scores. And trashing public education in the media is nothing more than laying the groundwork for more testing and more privatization. So why would the MEA be willing to sit down with this group? Because the MEA sits down with any group that wants to improve (read: get more control over) public education. It's their job to be at the table, to represent the teacher voice in policy decisions. I'm no more skeptical of this group than any other group (dating back to the 1990s)--I never lose hope entirely. But seeing this as something new and promising is folly.